Dreamstime – Royalty Free Stock Images – Over 20M Stock Photos From as Little as $0.20 or Free. On 10-11 December 2013, a Radical Emissions Reduction Conference was held at the Royal Society, London under the auspices of the Tyndall Centre for Climate Change Research at the University of East Anglia. In this blog, we look at a presentation by Professor Corinne Le Quere, of the Tyndall Centre for Climate Change Research, University of East Anglia on “The scientific case for radical emissions reductions”. Le Quere framed “radical emission reductions” as reductions consistent with a two-in-three chance of keeping global warming to less than 2 degrees Celsius (°C), saying that there is no surety that 2°C is a safe threshold, but according to the geological record, there have been periods of up to 2°C warming during the past 800,000 years that did not trigger any “nasty or unexpected” feedbacks, though sea-levels were 5–10 metres higher than today. Le Quere told the conference there were no analogues for 4-to-5°C warming in geological record, though there have been coolings of that magnitude, during the last glaciation 20,000 years ago, when environments were transformed. The UK, for example, was covered by ice a mile thick, which may gives an idea of the change that may occur in a world of 9 billion people. Thresholds and effects in climate system, such as methane from permafrost and sediments, and Amazon dieback, are poorly known and we don’t really know at what level of warming these occur. 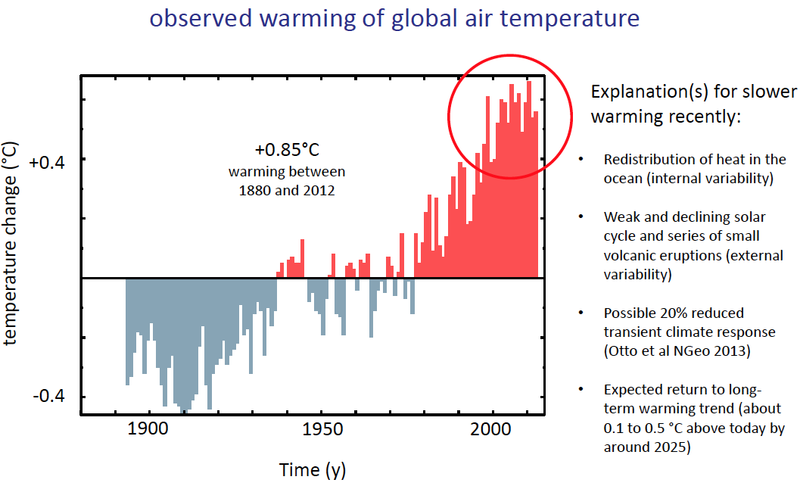 Warming that has occurred is committed for up to 1000 years. Le Quere said if emissions cease now we get no further warming. Future warming is from future emissions, and near-term emissions cuts decrease the rate of warming immediately. However there is an expectation of return to the longer-term warming trend, with additional warming of 0.1–0.5°C by 2025 compared to today. 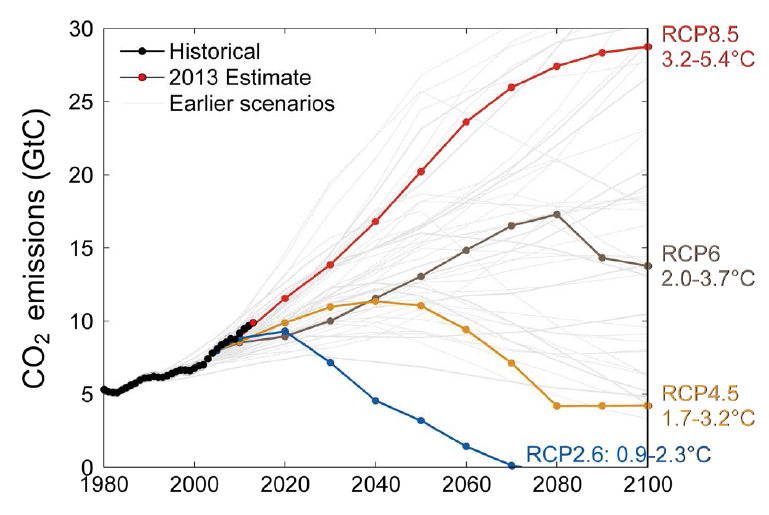 Looking at emissions so far, against four IPCC scenarios, we are now following the highest and most carbon-intensive scenario (RCP8.5) which leads to 3.2–5.4°C of warming. Our emissions could change rapidly because there are tipping points in society, such as reaction to extreme events, and the likelihood they will recur and increase in severity. The people who are directly affected and pay during these extreme events will do their own sums and determine what it means for their own budgets not to mitigate climate change. There have been many such large-scale events, including the 2005 European heatwave, the 2010 crop failure in Russia, the 2012 crop failure in the USA, the Australian 2013 heatwave, and Hurricane Sandy. Although Sandy itself cannot be attributed to climate change, 20 cm of the 1metre storm surge that invaded the subway of New York is directly attributed to climate change. This was the most expensive damage caused by the hurricane, which cost $60 billion in damage in total. Academic community must be ready to step in to offer solutions and examples at time when mentality changes, as a result of realisations of the costs caused by damage from continuing emissions. can a prosperous society be aligned with rapidly reducing demand? which policy options efficiently, effectively and equitably delivery? where can we find example of radical change and why have they worked? what are the impacts and opportunities for scaling up radical change? 2. Identify key triggers, barriers and/or opportunities, and develop an agenda to progress beyond the Conference. 3. Generate momentum for radical change thinking, and share ideas and experience between academics and practitioners.